This home in Greenwich, CT had old insulation that just wasn't doing the job. It was causing the owner's energy bills to rise, and their home was cold when it should've been warm! They gave us a call at Dr. Energy Saver of Connecticut, and we were happy to come out, and see what we could do to solve the problem! Our Home Comfort Specialist, Keith Saunders, surveyed the space, and quickly realized what needed to be done. He called on Dan Kiley, and he quickly came out to install new insulation in the home. After removing all of the old insulation, Dan and his comfort crew installed our closed cell spray foam. This two part foam has an high R-value per inch, seals of air infiltration, forms a moisture barrier, and absorbs sound. It works so well that it cut this family's energy bills in half! If you're looking to solve your own home energy problems, give us a call at Dr. Energy Saver of Connect for your FREE energy evaluation! Would like a home energy consult and estimate. Uneven HVAC throughout the Home, cold air entering from can lights. 785 sqft cottage inefficient? Electric costs extremely high. Heat pump is inadequate. I am a contractor just shopping prices for a 250 sq ft addition and kitchen. The homeowner would like spray foam insulation not blown in insulation. If you could send me an email with costs etc. it would be greatly appreciated. We recently had insulation work done by Dr. EnergySaver, led by Johnny Lopez and his crew. Johnny was great! Considerate and respectful, very neat, and kept me informed every step of the way as to what he was doing, what would happen next and any surprises he found along the way. They finished within the timeframe predicted, and cleaned up after themselves…completely…a rarity these days. The entire crew were upbeat, friendly and efficient. The project went really well, has made a big difference and we are very grateful to Johnny and his guys. I recommend them without reservation. I like the way the representative that came out explained everything! I enjoyed the way the estimate was written up and the R values were given.The install crew who came out to my Greenwich home did an excellent job in my home. I had Dr. Energy Saver seal and insulate my garage ceiling in my Greenwich home, to help stop drafts and make my family room floor warmer. Now we will be more comfortable spending time in our family room!! Dr. Energy Saver Of Connecticut is committed to customer service and is proud to serve our area. We have a certified team of technicians that are ready to help you find the best solution using quality products from the best manufacturers in the business. We want to work with you so that you can have the best results for your home! 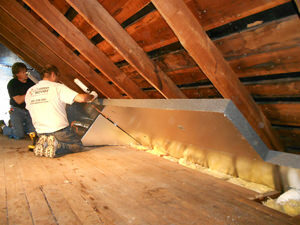 During the winter, heat often escapes through the attic of a house and through the roof. This can cause your home to uncomfortably cold or hot, not to mention rack up a high energy bill. With our SuperAttic system, we can remedy your attic problems with a continuous air and insulation barrier with no thermal bridging to compromise energy performance. With this process, roof ventilation is maintained without allowing unwonted, exterior air in. The benefits of spray foam make it better equipped for insulating attics than rigid foam. Spray foam insulation can expand to seal in smaller holes and cracks which can leak out air; the process can, however, become a bit more messy than rigid insulation. Rigid insulation, though it is easier to cut to fit an area and has varying thicknesses, takes longer to install and because it cannot expand like spray foam, is really more suited for insulating basements and crawl spaces. Many homes suffer discomfort and can become too hot or too cold because air is not properly circulating through the house. A major part of this problem is that poor insulation causes air to leak through cracks into the attic and then through the roof. Once this happens, more air is drawn up from the basement or crawl space which allows cold air from the outside to circulate through the house, making it very uncomfortable to live in even if the furnace is working. This is known as the "stack effect." By properly insulating and air sealing your home, you can prevent this from happening and save more on your energy bill. The location of crawl spaces in the home, as earlier mentioned, make it a prime target for cold air to leak in through in the winter time. By insulating with our amazing SilverGlo rigid insulation, you can trap moisture and bugs out while keeping good air in, making your crawl space an energy-efficient part of your home instead of a problem area. One thing that few homeowners are really aware of as a danger to their home is ice damming. This occurs when heat escapes from the attic and melts snow on the roof. As the snow melts, it slides down the roof to the gutter where it freezes again and overtime, this builds up to the point where water just sits on the roof, dammed up by the ice. This water then leaks back through the roof shingles into the house. This can be prevented, however, by installing energy-efficient insulation that will keep heat from escaping in the first place. Windows and doors are another area where air can leak out easily. Cracks and gaps along the edges of doors and windows can allow a significant amount of air to leak out; homes with window insulation this poor have the energy loss equivalent of having a window open all the time. Investing in replacing your windows means you get the expertise of our professional technicians to measure your windows with precision so that you can be sure that you won't have to worry about air leaks. 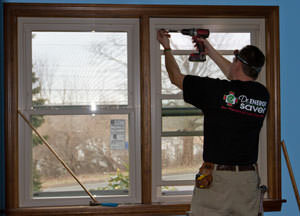 Dr. Energy Saver Of Connecticut has the tools and the expertise to provide a solution to all your home insulation and air sealing problems. Our friendly, knowledgeable staff want to work with you so that you can get great, long lasting results in your home. Call us today for a free estimate! This Greenwich, CT homeowner noticed uneven temperatures throughout his home, as well as an excess of moisture in his basement. Luckily, a friend of his had previously had their basement waterproofed by CT Basement Systems. He knew that the company had a division devoted to home comfort and energy efficiency and referred the homeowner to Dr Energy Saver of CT. Sales Representative Anthony Martingano traveled to the home to evaluate the situation. Ultimately, there seemed to be three main areas of concern. On the lower level, poorly insulated rim joists were allowing both air and moisture to enter the home’s basement. On the main level, a lack of insulation in the garage was leading to elevated temperatures in an adjacent bedroom as well as the living space above. Finally, inadequate insulation in the attic was compounding these problems and leading to uncomfortable temperatures throughout the home. This combination of heat and moisture left potential for mold growth and made energy efficiency impossible. Without proper air sealing and insulation, treated air from inside the home escapes outside, as outside air flows freely in. On the initial day of production, Foreman David Hicks and his crew insulated the home’s rim joists and installed Dense-Pack Cellulose insulation in the garage. On the second day of production, Foreman Ken Hartsburg and his crew arrived to remove existing insulation from the attic and basement. They then air sealed these areas with Open Cell Spray Foam, which the homeowner chose because it acts as an air, moisture, and thermal barrier, ensuring excellent R-value. Because of the crews’ work, the homeowner was able to enjoy consistent temperatures and increased energy efficiency throughout his home. My home is 60 years old and drafty. I would like to spray foam the first floor of my house and would like an estimate. It measures 962 sq.ft and the walls are 9 ft high, total of 8,658 sq.ft. Thanks. We had some leakage in our exterior walls and opened up the drywall and took out the fiberglass insulation. We have five empty cavities, 14" wide by 100" tall. One of them has no plywood (it all rotted) so the backing is just the foamboard behind the stucco. The others are plywood. Would Airkrete be a good option in this case? Looking for an estimate for insulation in the attic and Kitchen. Looking for a very good cellouse insulation company for our attic.